The Latin Lady a velvet colored bud, is a very exceptional floret because of its petals; the exterior of the petals is a soothing creamy white while the interior is a soft pink. 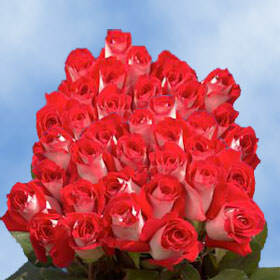 Velvet Roses are great for mixing with other followers due to their duo colored nature. Great for weddings, with their bi-colors of white and red symbolize Love and Purity. Also, this floret also makes a great addition to any conformation, birthday party, or Valentine's Day dinner. When used in a centerpiece, they are sure to cause your guest to stare and wish they could get close enough to take a long deep whiff. At Globalrose.com we take pride in our blossoms and Mother Nature. That is why we make sure to follow some of the most rigorous environmental friendly standards in the industry. We follow these protocols all year round as we provide three hundred and sixty-five day availability. Whenever you are in need of Velvet Roses just log on and order, we will be there to process your orders. We ship all of our products via FedEx, an industry leader, to provide accurate and speedy delivery. We have partnered with FedEx to give free shipping to all customers' in the continental USA. When your parcel arrives, all of your buds will be closed. Please allow two to three days for them to fully blossom.